Acute pancreatitis is an important cause of acute upper abdominal pain associated with vomiting. The common causes include gall bladder stone disease, alcoholism and idiopathicwhere no obvious cause is discernible. Fortunately the majority of cases of acute pancreatitis are mild and respond to conservative treatment. In less than 10% the disease is more severe and follows a vicious course with immense clinical and socio economic implications. These guidelines will help in the initial management of these patients at the secondary district level hospital and also at the more advanced tertiary metro super specialty centre. A typical patient presents with severe agonizing upper abdominal pain which may radiate to the back and is associated with retching and vomiting. The patient may be a known case of gall bladder stone disease or give a history of chronic alcohol consumption or a recent alcoholic binge. Clinical examination early in the disease process may reveal upper abdominal tenderness guarding and later the patient will show all the features of hypovolaemia including shock as third spacing of fluids sets in. I. A 3-4 fold increase in serum amylase level within 48 hours of onset of pain is highly suggestive of the diagnosis of acute pancreatitis. Initial management is aimed at relieving pain and administration of IV fluids to maintain core perfusion as evidenced by good urine output. Subsequently management of containing pancreatitis is best done in tertiary multi super specialty hospitals with expertise in dealing with such patients. The exact incidence of acute pancreatitis in India is unknown as no hard data is available. The incidence is rising world wide with the United Kingdom reporting an incidence range of 150-420 cases per million population. 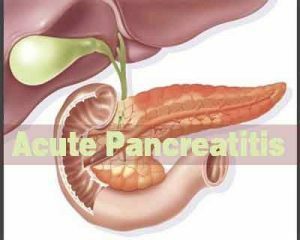 The experience of senior clinicians from personal experience seems to suggest that even in India incidence of Acute Pancreatitis appears to be rising and patients are being seen frequently.. The differential diagnosis of acute pancreatitis include all the differentials of the syndrome of sudden onset severe epigastric pain associated with vomiting. In a known case of alcohol induced pancreatitis the patient must be counselled about the role of alcohol and that abstaining from it will prevent a further episode of pancreatitis. Similarly avoidance of fatty food and early cholecystectomy in a known case of biliary or gall stone induced pancreatitis will prevent further attacks. Diagnosis of acute pancreatitis is based on the presentation with severe acute upper and abdominal pain and a three to four fold increase in the level of serum amylase within 48 hours of onset of pain. Investigation to confirm the diagnosis and exclude other possibilities is a contrast enhanced CT examination of the abdomen. An early CT (within the first few hours or day 1-2) will be helpful if no diagnosis has been made in 48 hours. The best time for CECT abdomen to establish the diagnosis of acute pancreatitis and extent of necrosis is 5-7 days. Further investigations need to be done to document severity of acute pancreatitis. These include CBC, BUN & serum creatinine, blood gas analysis, C-reactive protein. Chest X-ray PA and ultrasound to demonstrate pleural effusion. Other investigations to help establish the cause of acute pancreatitis include, MRCPMagnetic Retrograde Cholangio Pancreaticography, ultrasound and increasingly endoultrasound. Criteria have been developed to predict mortality in Acute Pancreatitis. These can be used to identify patients who will do well to be referred to tertiary centres for further management. Facilities in the peripheral or district level hospitals may not be adequate to do APACHE scoring. Hence a simpler bedside index may be more relevant and suitable to our condition. The BISAP – Bedside index for severity of Acute Pancreatitis is ideally suited to our needs. It is simple, clinically oriented severity scoring system that can predict mortality of Acute Pancreatitis. One point is assigned for each variable within 24 hours of presentation and then added for a composite score of 0-5 . At secondary hospital/ non metro situation optimal standards of treatment in situation where technology and resources are limited. Abdominal pain and vomiting together with 3-4 times raised plasma concentration of amylase and lipase with 3-4 days of onset of pain is diagnostic of Acute Pancreatitis. The half life of amylase is shorter compared to lipase. Therefore lipase levels remain elevated longer as compared to amylase. Also because the pancreas is the only source of lipase it has superior sensitivity and specificity and greater overall diagnostic accuracy than amylase. Plain X ray abdomen and ultrasonography (USG) may not directly aid in the diagnosis of Acute pancreatitis but are important investigations to demonstrate gall stones and rule out other causes of acute abdomen like enteric or upper GI perforation. A plain x ray of the chest and USG together may demonstrate pleural effusion which will be an aid in the BISAP scoring. 1.Prompt and adequate crystalloid infusion to maintain core perfusion as evidenced by catheterising the patient and maintaining an urine output of 1 ml/kg/hour. 2.Adequate oxygenation to maintain an sPO2 above 95%. 3.Nutritional support – unless nausea and vomiting are troublesome. Oral intake should nbe encouraged. Enteral feeding by nasogastric tube is as effective as nasojejunal tube feed. A blenderised low fat low protein kitchen tube feed supplying 2400 kcal/ day is sufficient for a 50 kg adult patient. Prolonged ileus more than 5 days necessitate total parenteral nutrition, which will fall in the purview of treatment at the superspecialty centre. 1.Pain relief can be provided by any available analgesic. Alkaloid opiates eg morphine should be avoided as it causes increase sphincter of oddi spasm. 2.Routine use of antibiotics is not recommended. For patients being transferred to a tertiary centre a stat dose of ciprofloxacin and metrogyl can be given and repeated after 8 hours if the travel time is more than 8 hours. a. Urgent therapeutic ERCP should be performed in patients with acute pancreatitis of suspected or proven gall stone aetiology which satisfy the criteria for predicted or actual severe pancreatitis or when there is cholangitis , jaundice or a dilated common bile duct. 4. EUS ( endoscopic ultrasound) – EUS has proven superiority over conventional abdominal ultrasound for the detection of CBD stones. It is of particular benefit in the evaluation of patients with recurrent acute pancreatitis. 5. MRCP – is an effective non invasive means of delineating biliary and pancreatic ductal anatomy. In patients with recurrent pancreatitis it can show CBD stones, ampullary strictures and presence of pancreatic divisium. 6. Image guided FNAC of pancreatic necrosis to confirm infected pancreatic necrosis. Continuing treatment at the tertiary centre is aimed at early detection and treatment of complications due to acute pancreatitis. Infected pancreatic necrosis is perhaps the most significant such complication. Role of antibiotics in preventing infected pancreatic necrosis continues to be controversial. Prophylactic antibiotics combining metronidazole with imipenem or a quinolone if used must be administered for 14 days. Recent data presented in the Dutch National PANTER trial seems to suggest that antibiotics alone maybe sufficient to treat a subset of patients with infected pancreatic necrosis. The acute inflammatory response is associated with impaired gut mucosal barrier function. Nutritional support helps preserve mucosal function and limit the stimulus to systemic inflammatory response. Enteral feeding is safer than parenteral feeding and has fewer septic complications. It also makes for better financial sense. In patients with severe disease oral intake is often inhibited by nausea. When enteral feeding is limited by the presence of ileus and nausea for more than five days, parenteral nutrition should be initiated. 1. All patients with biliary pancreatitis should undergo definitive management of gall stones during the same hospital admission in the form of cholecystectomy. 2. Patients with established infected pancreatic necrosis who continue to remain febrile three to four weeks after the onset of pain must be considered for intervention to drain the infected necrosis. 3. Intervention should ideally be delayed into the fourth week of pancreatitis. Earlier interventions are associated with poor outcomes. 4. A stepped up approach starting with radiological guided needle aspirations, endoscopic guided lesser sac aspiration and going on to video assisted retro peritoneal endoscopic drainage maybe preferred to open conventional necrosectomy if all facilities are available at the tertiary hospital. 5. Conventional necrosectomy is acceptable treatment if the above facilities are not available. It is recommended that a cholecystectomy be added during the necrosectomy particularly in patients with biliary pancreatitis. 6. A feeding jejunostomy must always be added in our Indian patients. 1. Every tertiary hospital receiving patients with pancreatitis should have a nominated clinical team to manage these patients. a. Clinicians : a multidisciplinary team of specialists including surgical and medical gastroenterologists, intensivists, nutritionists and other support staff of the intensive care unit. b. Facilities for dynamic multislice C.T., percutaneous needle aspiration and drainage procedure and MR imaging. c. Facilities for ERCP and EUS.